Sunday May 12th 1878 I got the work done in time to go to church this morning. I helped do the work all day getting a little time to read both in the afternoon and evening. Weather warmer. 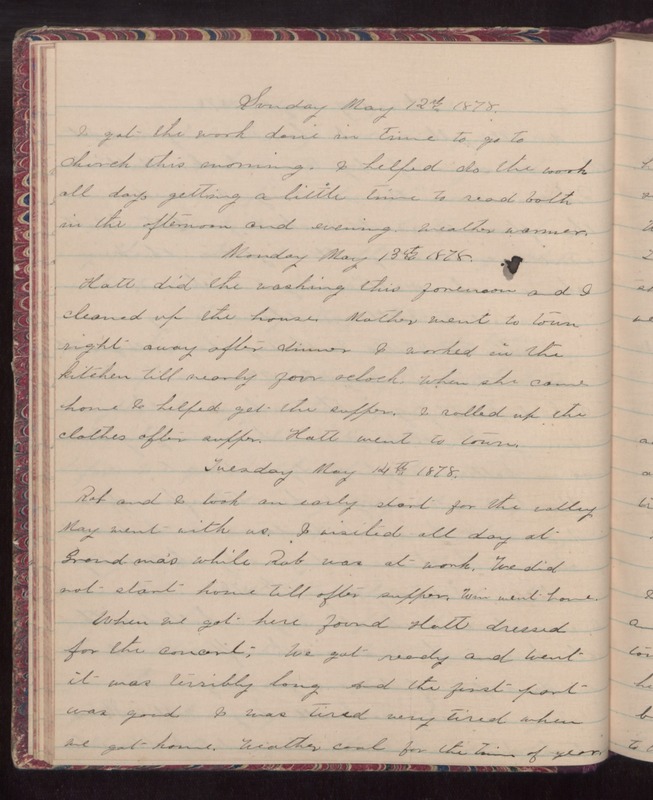 Monday May 13th 1878 Hatt did the washing this forenoon and I cleaned up the house. Mother went to town right away after dinner. I worked in teh kitchen till nearly four oclock when she came home. I helped get the supper. I rolled up the clothes after supper. Hatt went to town. Tuesday May 14th 1878 Rob and I took an early start for the valley. May went with us. I visited all day at Grandma's while Rod was at work. We did not start home till after supper. Win went home. When we got here found Hatt dressed for the concert. We got ready and went it was terribly long and the first part was good. I was tired very tired when we got home. Weather cool for the time of year.